Three restaurants in the South West have made it into the top 20 of the Good Food Guide. The 2009 edition of the "foodies bible" said a number of talented new chefs were chasing the established "old guard" for the top spots. 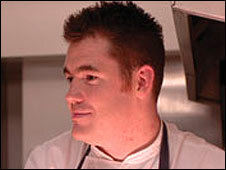 Nathan Outlaw was praised for producing "incredible food" at his restaurant in Fowey, Cornwall. It was placed 11th. In Jersey, Shaun Rankin's Bohemia came in at 17th position, with Michael Caines' Gidleigh Park at 20th. Elizabeth Carter, the Good Food Guide's editor, said it was an exciting time for the UK restaurant scene. She said Restaurant Nathan Outlaw, at the Marina Hotel, was making "discreet but powerful waves" with the food cooked up by the 30-year-old Michelin-starred chef. Shaun Rankin was described by the editor as a "hugely accomplished talent, cooking at the top of his game". For the second year, top spot went to The Fat Duck in Bray, Berkshire, owned by Heston Blumenthal. The experimental television chef's restaurant was the only one to be awarded 10 out of 10 by the guide.